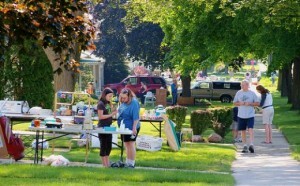 Residents in the village of Oriental are joining forces this weekend for a Town Wide, 88 Home Yard Sale. This is an annual event for the town, held this year on Saturday, May 1st from 8:00am until 1:00pm. So come out this weekend, stroll through the streets of town and pick up your fun and funky finds. All in walking distance to shops and restaurants…..and the weatherman says upper 70s and sunny. What a novel idea…..bargain hunters get to stroll from yard to yard til their hearts content, and those who need to empty their garages no longer have an excuse to procrastinate on spring cleaning!